Joe Soko Marathon All This Month! Joe Soko has been producing his half hour comedy program, The Joe Soko Show for years, first during his time in San Francisco and now here in Madison. It airs each week on WYOU in its regular time slot, Tuesdays at 9:30pm. Now we're happy to announce the first ever Joe Soko Marathon! Every Wednesday night in February from 11:00pm-3:00am, get back-to-back-to-back Soko. All Joe all the time! And you can visit Joe Soko online too! On Sunday, January 24th, WYOU producer Sankulay Jallow welcomed some special guests on his West Africa Experience program. 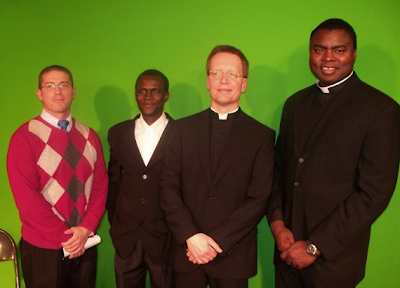 Brent King, Monsignor James Bartyll, and Father Paul Ugo Arinze (from the Bishop O'Connor Catholic Pastoral Center) spoke about the disaster in Haiti and how people can help with the efforts to send aid. For more information, visit their website at www.madisonvocations.org. Mad Rollin Dolls Finals Helmet Cam with Droids Attack! from Eric Allin on Vimeo. Sunday Nights at 8:00 pm! The WYOU board will be meeting tomorrow evening, 6:30pm here at the station, 609 East Washington Avenue in Madison. We look forward to a bright successful new year here at WYOU!